Hallways take up a lot of room in a home. Functionally, they will get you to and from one space to the next, but little else. With the rising cost per square foot of the current Chicago real estate market*, it's best to make every square inch count. One strategy is to open up the hallway into an adjoining room, creating a "walk through" space that handles dual purposes. These "passageway" spaces can visually enlarge a home by combining two or more chopped up areas that serve no other purpose other than walking from one space to another and replacing them with fewer, larger spaces that are multifunctional. 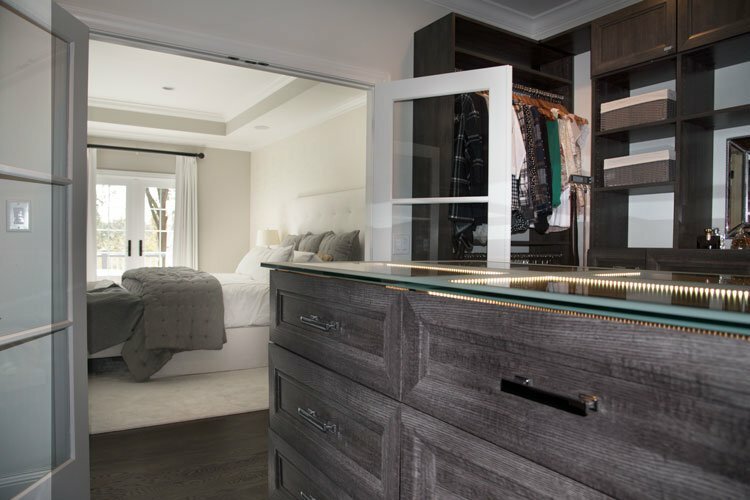 The master bedroom closet is a popular choice for a walk through closet space. 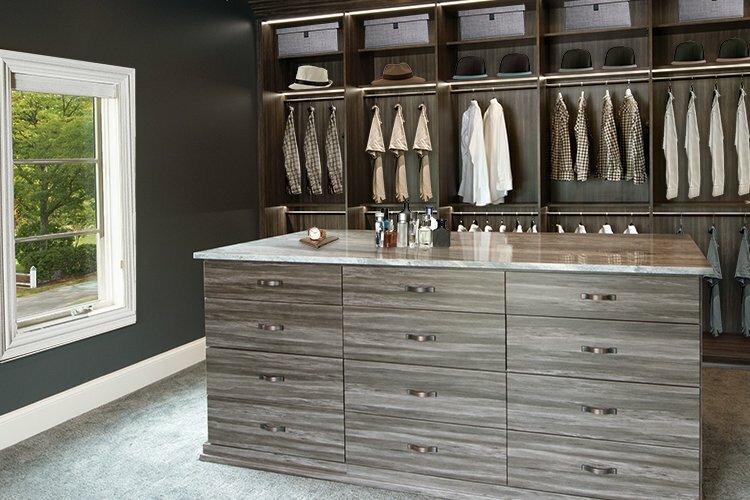 A walk through closet is a type of walk in closet that connects one room to another — usually the master bedroom to an en suite or "master bath." They can, however, also serve as a functional passage to an "away room," home office, or other private retreat. Floor Space: Consider your traffic pattern and leave a clear path. You must have at least 36" width of empty floor space for circulation. The room still needs to function as a passageway in addition to storage and you don't want to be climbing over containers or furniture to get from one room to another. If you have a closet island or other piece of furniture in the center of the room, the 36" space needs to be on every side of the piece. Accessorize: Dress up the space with elegant accents like crystal knobs and special countertops. A walk through closet is a semi public space in your home that will be on display as you or others pass through it. Splurge on high quality components in the construction such as better laminate or veneer finishes. Adding crown mouldings and trim can present a polished look worthy of any room in the home, and they are available in both contemporary or traditional styles. Keep It Neat: You will quickly tire of walking through a messy or disorganized closet. Being surrounded by a cluttered space adds mental stress to our lives. Besides, a walk through closet is potentially a space other people will see. There are certain tricks you can use to keep everything orderly. Conceal closet sections that you can't keep showplace neat behind closed cabinet doors, similar to a wardrobe style closet section or armoire. Use attractive baskets or boxes on shelves to corral the small items. Fewer, larger items on your shelves will look neater than lots of little clutter. Use hidden or built in hampers and other closet pull outs to keep the messy stuff like laundry accessible, but out of everyday sight. Create a Focal Point: Add a distinctive focal point to the walk through room by selecting one unique feature to emphasize. This can be an elegant chaise lounge, a unique closet island, special jewelry cases or another feature that is important to you. Illuminate: Use LED closet lighting to highlight different areas and functions just as you would in a kitchen. Task lighting should be available over countertops as well as some type of ambient lighting for the rest of the space. Dimmers can be used to great effect in a walk through closet space, allowing different areas to be both highlighted or de-emphasized as needed. Unify: The walk through needs to function as the visually unifying element between the two spaces. Bring in colors from the rooms on either end of the walk through to create a cohesive, transitional space. Blending the bedroom style and the bathroom decor through your choices of finishes and accessories in the walk through will make your spaces flow better overall. Make it Symmetrical That doesn't mean that both sides have to be exactly the same. The key is to make the space feel balanced with a clear focal point. For example, a large closet hutch on one side of the room could be balanced by a set of wardrobe style cabinets of approximately the same heft on the opposite wall. The exact pieces and configurations will dictated by your individual storage needs. Use Every Available Surface: It goes without saying that anytime you are trying to maximize your storage, you should not waste any opportunities. Potential may lie in even the smallest details and can make the difference between a hit or miss closet solution. Every bit of wall space needs to be put to sensible use in order to ensure that you will have enough open space in the center of the room for walking, plus room for the focal point island, table, lounge chair, etc. If you have extra high ceilings, consider pull down closet rods so that you can build up with your closet design. A walk through closet can be either an eye sore or an asset depending on how it is handled. If you follow these essential tips, you will ensure that your closet falls into the latter category, adding practicality, functionality and beauty to your home. Closet Works is Chicagolands' largest and most experienced provider of custom storage solutions. Since 1987, we have been helping homeowners by creating custom closets, pantries, office/guest rooms, wall units and more to help create a better, less stressful lifestyle. Great ideas to "Organize Your Life" and examples of our closets and other custom organization systems can be found throughout our website. For more information on Closet Works call toll-free at 800-4-CLOSET (800-425-6738). Bedroom to Bathroom Walk Through Closet with Elegant Jewelry Display in Closet Island as Focal Point: Double doors connect this walk through closet to a master bedroom on one end and a private en suite on the other. Gray wood tone laminate in "Vintage" with white and chrome accents brings in the colors from the master bedroom and the bathroom. Gray baskets on open shelves organize small items like scarves. Mirrored cabinet doors on small wardrobe units conceal any mess in this beautifully organized space. 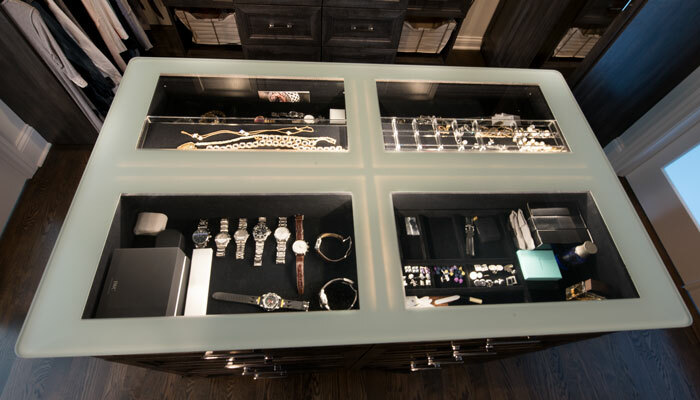 A custom countertop in white frosted and clear glass highlights a jewelry display in the upper drawers of the closet island. Walk Through Closet Connects to Home Office/Den: This walk through closet is part of the owner's private man cave. The closet opens out to a home office/den area with a flat screen TV, desk and sofa for lounging. Note the use of elegant storage boxes on the upper shelves to corral any clutter and messy stacks of clothing — keeping it out of sight, but accessible. 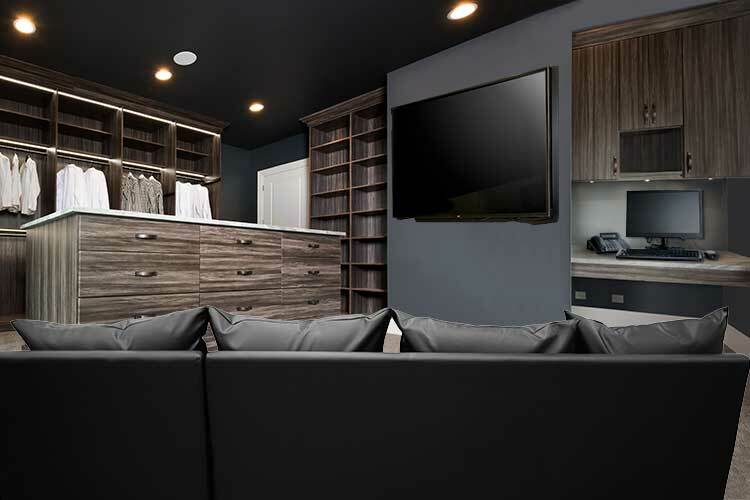 Crown mouldings and an elaborate LED closet lighting system add the finishing touches to the space, ensuring it is an elegant showplace in addition to practical storage.